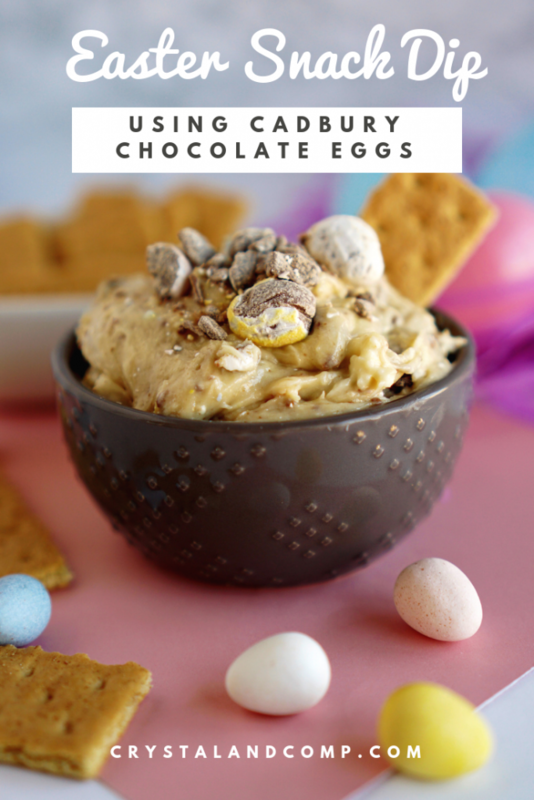 If you are looking for the perfect Easter snack to make for your child’s party at school, for your church potluck, for your Easter family get together, I have the perfect recipe for you! Let me show you just how easy this is to create. It can literally be made in less than ten minutes! First, let’s gather up our ingredients, including those milk chocolate eggs that we are going to crush up and add to the dip. Grab your hand mixer and mix together the butter and cream cheese until smooth over a medium speed in a large mixing bowl. Once that is well combined, add in the brown sugar, powdered sugar, salt, and vanilla and continue to mix over medium speed. To crush up the Cadbury Mini Chocolate Eggs, you can either use a knife and a cutting board and chop them up OR you can put them in a ziplock bag, remove all the air and seal. Then take a rolling pin over the bag to crush them up. Add the crushed chocolate covered candies to the mix saving about 1/4th of it for garnishing the top of the dip. Gently fold in chopped chocolate eggs using a rubber spatula. Grab your favorite Easter serving dish that is the perfect side for serving a dip and move it over to the serving dish. 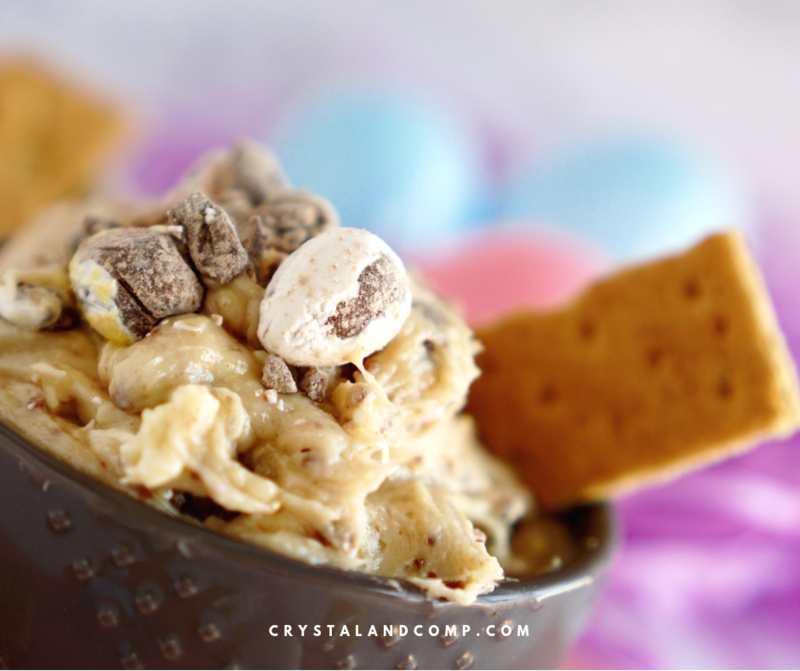 Top the snack dip with some of the reserved chopped candy eggs. Cover it and pop it in the fridge to chill until you are ready to serve it. 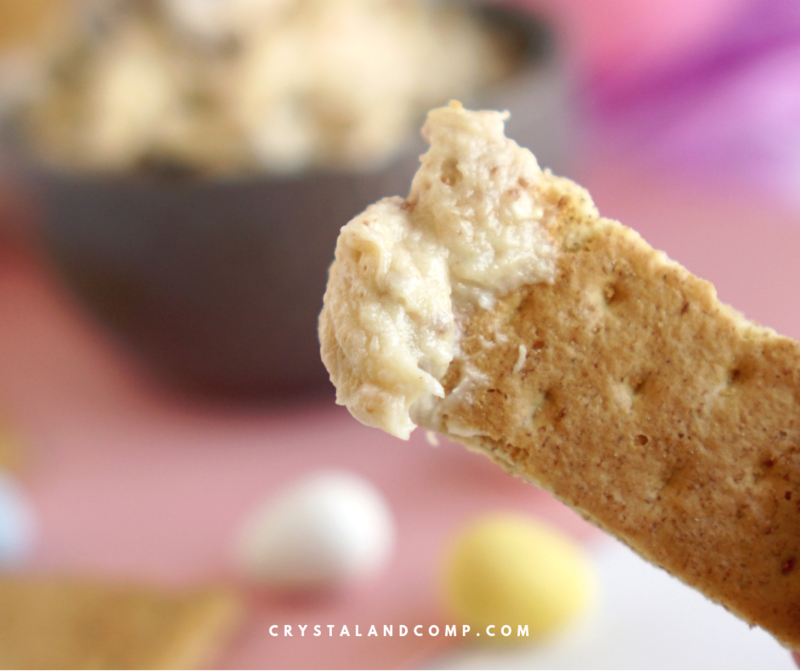 Easter treats like this are served perfectly with graham crackers, vanilla wafers, pretzels, or fruit! The Easter Bunny will love this sweet treat! 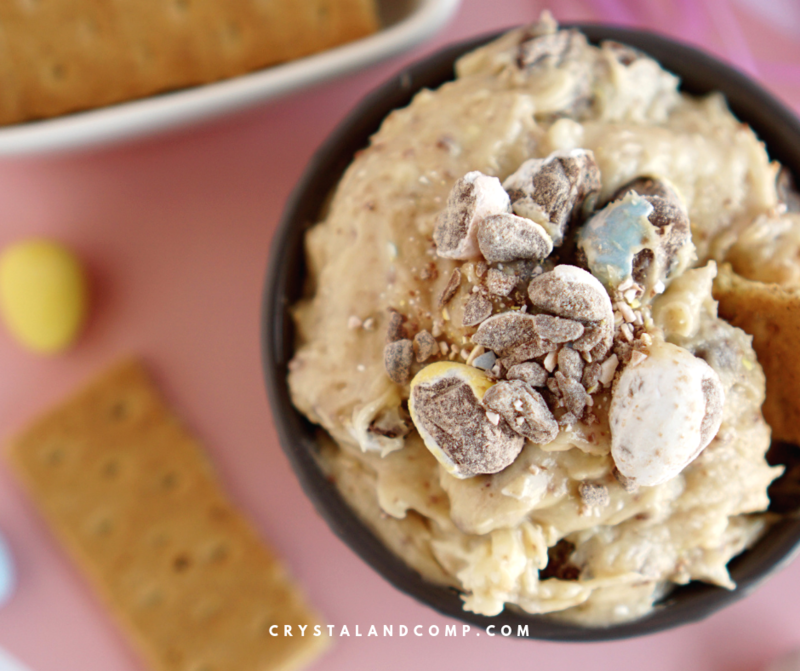 I personally think this could be served in your favorite Easter egg inspired candy dish! What are Cadbury Mini Chocolate Eggs Made Of? These are actually milk chocolate on the inside with no cream at all. They have a harder candy outer shell that is usually pink, blue, yellow or white. You should be able to find these at stores like Target, Walmart, CVS, Walgreens, etc., during the Easter season. How are Cadbury Mini Chocolate Eggs Made? I love this video that shows someones your inside the factory where these mini eggs are produced. Super interesting to me. They show not only how these are made but the quality assurance. Can I Use Melted Butter Instead? No. Melted butter would change the consistency of the dip and make it very runny. You want to use softened butter that has been sitting out on the counter for a couple of hours. You want it soft all the way through. If you use butter that is not truly soft and at room temperature, it will not be smooth enough to mix with the cream cheese. Does the Cream Cheese Have to Be Soft? Yes! Do not melt it either. Just like the butter, leave it sitting out on the counter for a couple of hours until it is soft all the way through. If it is not soft it is not going to mix with the other ingredients. 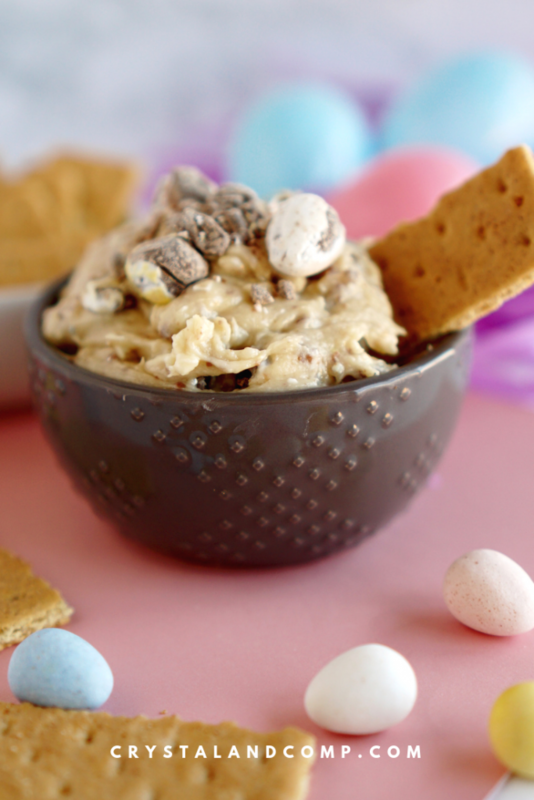 Your Cadbury Easter Dip looks delicious and perfect for the season! Thanks so much for sharing your post with us for our special St. Patrick’s Day Full Plate Thursday! Have a great week and come back soon.